The skill beta testing tool can be used to test your Alexa skill in beta before releasing it to production. You can also use the skill beta testing tool to test changes to an existing skill, while still keeping the currently live version of the skill available for the general public. You can invite friends or family, your social network contacts, or other people for whom you have an email address to test your skill and provide feedback. You can send up to 500 invitations per skill. At any time, you can add testers, remove testers, or end a test. You can see tester feedback in the Amazon Developer Portal. You can get feedback on your skill throughout the testing cycle, and reduce costs by making fixes before you release the skill to production. Using skill beta testing can help increase your chances of skill success. 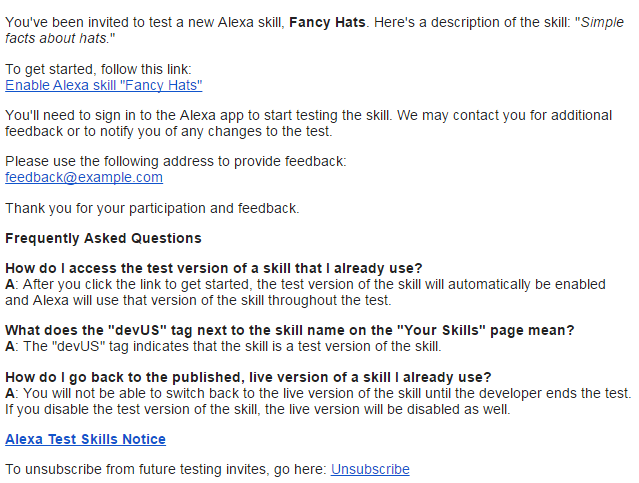 Note: The skill beta testing tool is only applicable for Alexa skill development. In order to use the beta skill, the Alexa device used by the beta tester must be associated with the email address in the tester's invitation. If the beta tester does not have an Alexa device registered to that email address, then the tester can create an Amazon account using that email address and register it to their Alexa device. Alternatively, the tester can contact the developer and request that a separate invite be sent to the email address to which their device is registered. You must enter a contact email address, as described in Create a Beta Test for Your Skill, in order for testers to contact you. Send beta testers the link to the beta skill from your own email account. This Invite URL link is available from the Manage testers page. See Manage a Beta Test for Your Skill. Instruct beta testers how to opt in to receiving Amazon emails by pointing them to Managing Your Account > Subscriptions & Communication Preferences. Edit your skill in the developer console. Navigate to the Distribution > Availability page. Expand Beta Test. If your skill is missing required information, this area indicates that beta test is not available. The Build page must be complete. All required fields on Distribution > Skill Preview must be complete. All required fields on Distribution > Privacy & Compliance must be complete. When all of this information is specified, your skill is eligible for testing with the skill beta testing tool. These steps also make your skill ready for certification. When you have a skill that is live, you can still create a beta version of this skill. The testers who have access to the beta version will not have access to the live version. A tester may request removal from a beta test, and then after removal, this tester can re-enable the live skill in the Alexa app. As described in Revise and Update Your Skill after Publication, once your skill is published, that version is what is available to the customer. The live version and the development version of your skill are shown on the developer console, as shown. Click Edit to change the development version. In this development version, use a different endpoint or Lambda function to ensure your original skill is not modified. Ensure all the criteria described in Make a New Skill Eligible for Testing are followed, and follow the steps to Create a Beta Test for Your Skill. Enter the Beta Test Administrator Email Address and click Add. Under Manage Access to your Skill Beta Test, add tester email addresses. Remember that this email address must be the one that the tester uses for their Alexa account. Separate each email address from the next with a semicolon or carriage return. To upload a file of email addresses, click Bulk Upload. These addresses must be separated by semicolons or carriage returns, or both. Click Add to save the tester email addresses. The email addresses are validated, checked for duplicates, and added to the test. If one or more email addressesare not valid, an error is displayed. Correct the email addresses and click Add again. Review the list of eligible testers. You can also add or remove testers after the test has started. Each tester will receive an email with a customized link inviting them to be beta testers for your skill. Amazon controls the messaging for this invitation. The invitation email takes the following form, with the subject line of "You're invited to test a new Alexa skill". When a beta tester clicks the link, they are prompted to log into their Amazon account and accept the Skill Beta Testing Terms and Conditions before they can start testing your skill. The Beta Test section of the Distribution > Availability page provides a dashboard, while a test is active, that shows which testers have accepted your invitation, and which allows you to add and remove testers. To open this dashboard, open the skill in the developer console and navigate to Distribution > Availability. The Beta Test box shows the current invitation status for each tester. From here, you can add testers, remove testers, send reminders to testers, send feedback requests to testers, or end a test. You can remove a tester from an ongoing test at any time. Click Remove tester for the tester you want to remove. The list of testers is updated. If you remove a tester, that tester will receive an email that the test has ended, although the test does continue for all of the remaining testers. If the skill has both a live version and a development version, then a tester who has been removed will resume having access to the live version. You can send a reminder to a tester for an ongoing test at any time. However, you are only allowed to send one reminder to each tester during the course of the beta test. Click Send a reminder for the tester. The tester is sent an email, again with the messaging controlled by Amazon. This email contains the same content as the original invitation email, but the subject line is "[Reminder] You're invited to test a new Alexa skill". Add the email addresses of the testers to the Tester emails box. You can enter the email addresses directly in the box, or click Bulk Upload to upload a CSV file with email addresses. Click Add to validate the email addresses. If necessary, correct the errors and click Add again. The newly added testers are listed in the box, along with the existing testers. They will be sent invitation emails the same as the original testers. You can choose to end a test at any time. Your testers will receive an email that the test has ended. Is the skill beta testing tool free? Yes, the skill beta testing tool is a free service. How can I share my beta skill with my friends and family? Obtain the email addresses that your friends and family use for their Alexa account. Add these email addresses to the beta test that you set up using the skill beta testing tool. The skill beta testing tool will send them the invitation emails by sharing a secure link to your skill generated by the skill beta testing tool. When a tester clicks the link, they will need to login with their Amazon credentials and opt in to test your skill. When the tester does opt in, the skill is automatically enabled on any device that's associated with that Amazon account. How long can the beta version be live? The beta version is live for a maximum of 90 days, at which point the beta test ends automatically and all participants are notified by email. During the 90-day period, you can choose to end the beta test at any time. Each beta test is limited to 90 days, and there is no way to extend a beta test. You can create a new beta test, which requires that you take the same steps as when you created the original test. What is the maximum number of beta testers I can invite per skill? You may invite up to 500 testers. What if my beta tester uses a device that has a different region and locale than my skill? If your skill is available for all regions, or available for the same region and locale as that of the beta tester's device, then they can use your skill. If your beta tester uses a device with a different region and locale than your skill, then they will not be able to use your skill. Can I have a beta test version of a skill at the same time that I have a live version of a skill? Yes, both a live version, which is available to the general public, and a beta test version, available only to selected testers, can co-exist. However, beta testers can only access the beta test version once they have enabled it, unless you remove the tester from the test, or a tester chooses to remove themself from the test, or the beta test is ended. Can I prompt testers for feedback? If at least one tester has enabled the skill, then on the Manage skill page, you can click the 'Request Feedback' button. Each tester who has enabled the skill will get an email request to send feedback to your contact email address. Can I customize the email messages sent to testers? You cannot customize these messages which are sent by Amazon. However, you can communicate with your testers outside the scope of the skill beta testing tool. Can I publish different beta versions of the skill to multiple groups? No, you cannot publish multiple version of the skill. Are the emails optimized for mobile? Yes, the email templates are optimized for mobile devices. How can the beta testers provide feedback? The testers will be able to provide feedback using the Give Feedback email link available within the invitation email. In addition, if the skill developer clicks the Request Feedback button on the Manage testers page, then another email requesting feedback is sent to those testers who have enabled the original beta skill link. How can beta users differentiate between a live skill and a beta skill? The beta skill will be tagged with a "dev" tag on the skill icon. Does the skill need to go through certification to be able to launch it as a beta? The skill does not require any certification to start a beta test. Can I update the beta version of the skill once I have published my beta? Yes, you can update the beta version of the skill, after you have published the beta. Can the beta testers unsubscribe to the invitation emails? Yes, beta testers will be able to unsubscribe from emails from the skill beta testing tool. Will developers be able to use actual Account linking with the skill beta testing tool? Yes, developers will be able to use the account linking feature with the beta testing tool, just as for live skills. How do I remove a tester from a beta test? To remove a tester, click the Remove Tester button next to their email address. You can also choose to end the test, which effectively removes access for all testers.